It’s hard not to like a clean white shiplap wall. Shown here is our Farmhouse Skiplap Wall Cladding, sent in from a California customer. We typically have in stock and ship directly from our warehouse to anywhere in the U.S.
Skiplap is the highest quality wall paneling on the market. Unlike shiplap, our Skiplap Wall Cladding is tongue and groove on all 4 sides for a zero waste wall paneling that can be blind nailed. Smooth to the touch, multi coat no VOC factory finish. 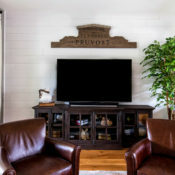 Shiplap, by definition, are “boards that have been milled so that the top and bottom of each piece has a rabbet joint, so they can be stacked as siding“. In a nutshell, shiplap boards rest on top of each other and overlap, while tongue-and-groove boards join together and interlock.